As Vlambeer, the studio I work at, has gotten bigger and our community has grown beyond our biggest fans, I've noticed a shift in the way people interact with us. Where we used to mostly get messages of support and understanding, the ratio of messages that treat us like two guys making video games versus those that treat us like a giant corporation that makes small games has slowly been tilting towards the latter. That's not a surprising development per se—with the release of Ridiculous Fishing we've reached hundreds of thousands of people who have no notion of Vlambeer beyond a quick logo at the boot of the game. While I'd much rather be treated like a human being who's trying his hardest to make everything work out, I can understand that for many people an e-mail to a support address means assuming a certain expectation to a product that perfectly fits their wishes. 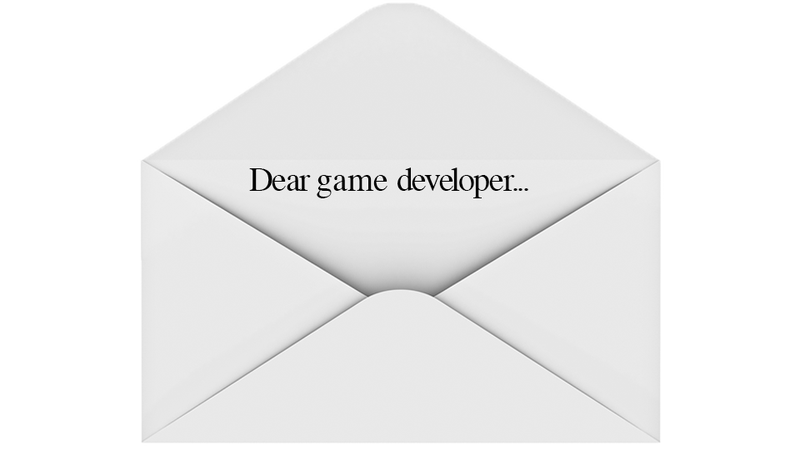 As a developer, I find that even the most hostile responses tend to be defused by just showing that you care—and we do care—so Vlambeer has steered well clear of extreme hostilities quite often. I can understand that for many people an e-mail to a support address means assuming a certain expectation to a product that perfectly fits their wishes. But I can't help but be surprised at one comment people continue to make when they're upset about something in an independent game. It is a comment that goes along the lines of 'if you don't fix this, I want a refund' or variations thereof threatening with online hate campaigns, low ratings, piracy and some creative way of costing us money. They claim that without the fans, we are nothing. I've often said the same thing at developer conventions around the world, but there's a difference between saying that to emphasize our thankfulness for and dependance upon people who love our games and literally implying we are not worth anything beyond the opinion of somebody on the internet who happened to play a game we made. We could literally decide to stop making games tomorrow and find a better paying and stable job—but we don't, because we love making games and we care about the people who invested money and time in our work. Dear players, we really care about your opinion. You're not quite the reason why we make games—we make games because we want to—but you're definitely the reason we can make a living doing this. You're the reason why we get to watch Let's Play videos and can interact with feedback. We want you to like and appreciate the game and the months of hard work we put into everything we make, because a game without players is an icon on a screen and nothing more. That's not how I want to treat people that play our games, and I know a lot of independent developers struggle with finding a balance between treating people the way they indicate they want to be treated (like a number) and the way we'd rather treat them (like humans). If a game is different from your expectations, or you can't find a setting you'd like, or you feel that you should have an option to turn off the music, or maybe you expect customizable controls—realize that the job of a developer is to make choices. Games are absurdly complex creations, but nothing in a game is by chance. Even the way dice roll in a game is designed, tweaked and iterated upon. Someone spent days tweaking the walking speed in every game, or on the way text bubbles are animated. Sure, sometimes something is literally an oversight, and in that case, developers love to hear about it. Chances are if you just make known that you'd love to see something different in a game, you'll either get a confirmation that they're working on it, a question about why you want what you propose or a response as to why it is not and probably will not be the way you request. Most developers want to hear your feedback, not because of your money or your ratings, but because people reaching out to us are our players. Developers are people who tend to be really curious about the way people interact with their work. They want to know what you think, and why you think that way. In fact, they spend most of their development cycle figuring out what a player might think and how they might react. Most developers want to hear your feedback, not because of your money or your ratings, but because the people reaching out to us are our players. You are the thing that makes our work whole. That's a pretty amazing relationship. But it is your choice. It's either about the game or about our bookkeeping. It's either about your enjoyment of the game or about your money. Of course developers will answer either approach, but our passion is with the game, not the money. If we wanted to earn money, we'd take our skills to a job that actually pays well. But we definitely want to talk about our game. You prefer to talk to a human being, not a corporation. We prefer to talk to a person, not a number. Rami Ismail is the developer & business guy at Vlambeer. He also created Presskit() & travels around the world to speak about game development and culture at events, schools and in emerging territories. Follow Vlambeer on Twitter or like them on Facebook.